Atif Mian Debacle: Should Imran Khan be Applauded or Attacked? 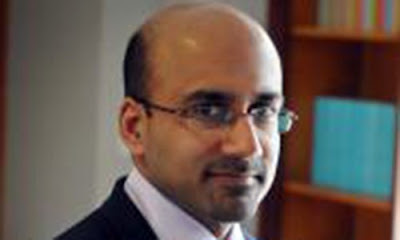 Pakistani-American Princeton economist Atif Mian was named to Pakistan Prime Minister's Economic Advisory Council and then promptly let go because of his Ahmadi faith. Two other economists Harvard's Professor Asim Khwaja and University College London's Imran Rasool have since quit the council in protest over Atif's removal. Is Atif Mian's removal a victory of bigotry over meritocracy promised by Imran Khan? Was it a mistake to name him and even bigger mistake to remove him? Did the PTI government underestimate strong reactions to the appointment and subsequent back-tracking? Was PTI caught off-guard by tweets such as "liberal" PPP leader Shehla Raza's tweet attacking Imran Khan for picking "the great grandson of Mirza Ghulam Ahmad Qadiani" as top economic advisor? Would PTI's refusal to remove Atif Mian lead to derailment of the entire PTI's anti-corruption and reform agenda? Should Imran Khan be applauded or criticized for taking such political risks? Does Imran Khan realize that he lacks sufficient political capital for such risks? What message does it send about the limits of Imran Khan's capacity to bring about change in Pakistani society? 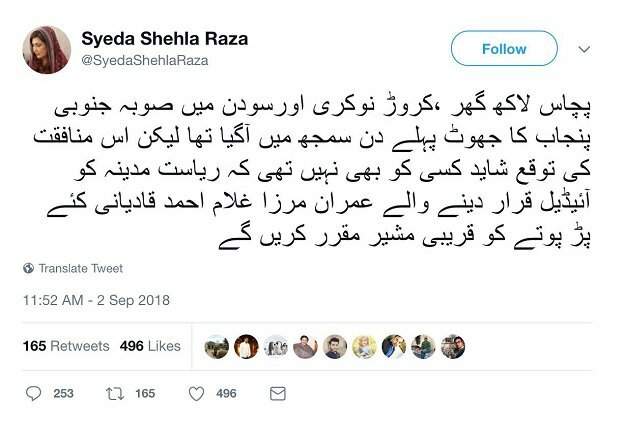 PPP Leader Shehla Raza's Tweet Attacking Imran Khan for picking "great grandson of Mirza Ghulam Ahmad Qadiani"
What can political leaders do to lead the people to greater tolerance of differences and acceptance of diversity in Pakistan? What must educators, mass media and civil society do to move Pakistan toward Quaid-e-Azam Mohammad Ali Jinnah's vision of an inclusive and tolerant Pakistan? How Can Imran Khan Help Karachi? Harvard professor Gita Gopinath’s appointment as chief economist of the International Monetary Fund raises a question about her native India: Is IMF Managing Director Christine Lagarde more likely than Prime Minister Narendra Modi to hire someone with Ms. Gopinath’s stellar academic credentials?